Whenever there is a successful run on this server, trace – if successful, give the Runner 1 tag. If unsuccessful, trash Bernice Mai. I’ve seen Bernice Mai more often than ChiLo City Grid, which I reviewed a few days ago. Why ? Certainly because it’s cheaper and less conditional. It offers a nice surprise tax to the Runner, as they have to reach the quite powerful trace to avoid the tag and get rid of her as soon. 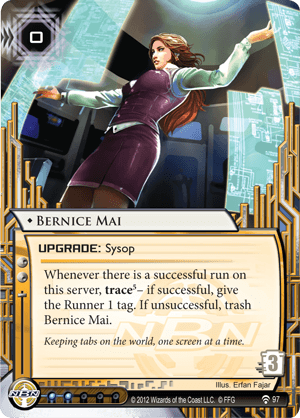 If they can't, they will hardly be able to trash her and remove the tag in the same turn, since for a link-less Runner, both of this options costs the same price (bare the click). few slot for upgrades, with serious contenders in-faction. doesn’t protect agenda in remote, except if it’s Kitty. And then, some ices do as much. could protect centrals, but there is another serious contender for R&D, so her role is shrunken. On a side note unrelated the game, she reminds me a pretty IT-girl working in the office next of mine. Not that they resemble so much, but I like to think of my co-worker as "the Bernice Mai of my company". She never gives me tag, tough.